Coalbed Methane (CBM) is natural gas contained in coal. It consists primarily of methane, the gas we use for home heating, gas fired electrical generation and industrial fuel. CBM commonly is referred to as an “unconventional” form of natural gas because it is primarily stored through adsorption to the coal itself rather than in the pore space of the rock, like most “conventional” gas. The gas is released in response to a drop in pressure in the coal. Coal Bed Methane (CBM), an unconventional source of natural gas is now considered as an alternative source for augmenting India’s energy resource. India has the fifth largest proven coal reserves in the world and thus holds significant prospects for exploration and exploitation of CBM. The prognosticated CBM resources in the country are about 92 TCF (2600 BCM) in 12 states of India. In order to harness CBM potential in the country, the Government of India formulated CBM policy in 1997 wherein CBM being Natural Gas is explored and exploited under the provisions of Oil Fields (Regulation & Development) Act 1948 (ORD Act 1948) and Petroleum & Natural Gas Rules 1959 (P&NG Rules 1959) administered by Ministry of Petroleum & Natural Gas (MOP&NG). CBM blocks were carved out by DGH in close interaction with Ministry of Coal (MoC) & Central Mine Planning and Design Institute (CMPDI), Ranchi. 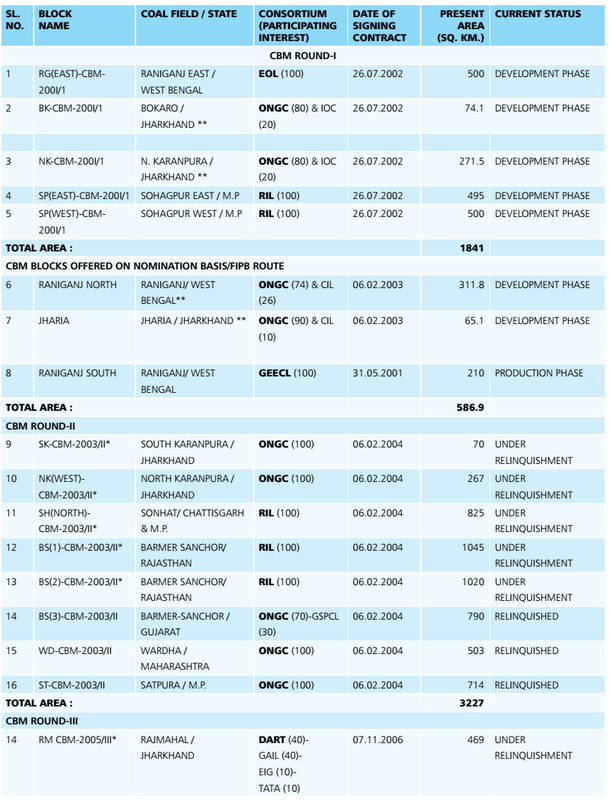 Under the CBM policy, till date, four rounds of CBM bidding rounds have been implemented by MoP&NG, resulting in award of 33 CBM blocks [including 2 blocks on Nomination and 1 block through Foreign Investment Promotion Board (FIPB) route] which covers 16,613 sq.km out of the total available coal bearing areas for CBM exploration of 26,000 sq.km. To date, most CBM exploration and production activities in India is pursued by domestic Indian companies. Total prognosticated CBM resource for awarded 33 CBM blocks, is about 62.4 TCF (1767 BCM), of which, so far, 9.9 TCF (280.34 BCM) has been established as Gas in Place (GIP).